He displayed great bravery in crossing the ravine under a hot fire and maintained his position there until his troop was withdrawn at the time the Hotchkiss gun was put in position. Sergeant William G. Austin had been in the cavalry and E Troop a month shy of four years when shots rang out on the Wounded Knee and the melee ensued at the council circle. By army records the native Texan from Savannah, Georgia, was twenty-eight; in fact he was only twenty-two at the time of the battle. Despite his youth, Austin proved to be a leader of men rising rapidly to the rank of sergeant. His leadership was evident on December 29 catching the attention of the three officers of E Troop. 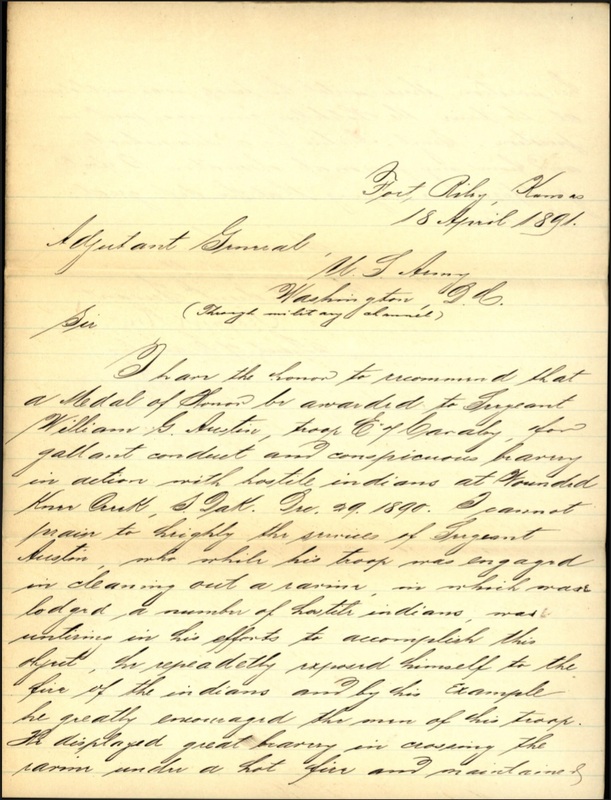 Lieutenant Sickel, who was commanding E Troop at Wounded Knee, wrote a letter to the adjutant general on April 17 detailing his personal observations of Sergeant Austin’s actions on December 29. (Click to enlarge) Lieutenant H. G. Sickel’s letter recommending Sergeant Austin be awarded a Medal of Honor. Throughout the engagement Sergt. Austin was conspicuous by his coolness and bravery, rendering his troop commander valuable assistance by placing the men on the skirmish line in good positions, directing their fire and encouraging them by good example. At one time while the troop was engaged, dismounted, with Indians concealed in the ravine, Sergt. Austin took an exposed position commanding a position of the ravine which protected the hostiles from the fire of the skirmishers and from which a deadly fire had been delivered, and by well directed shots caused the fire from that point to cease. 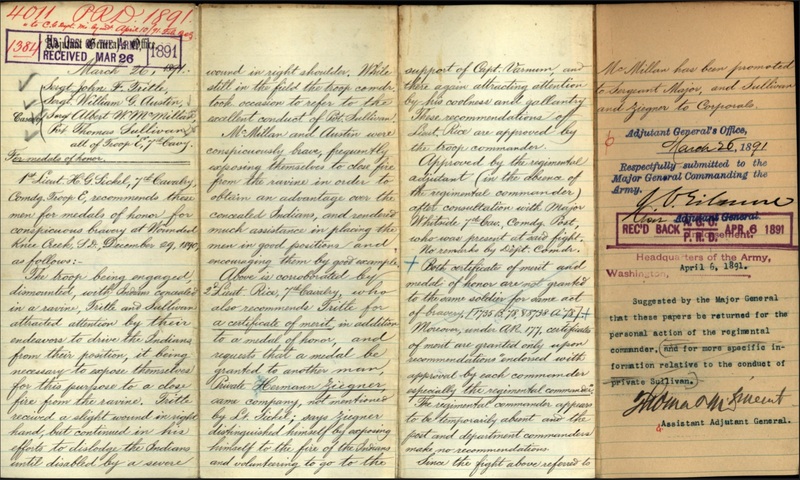 Lieutenant Rice added a letter of his own the following day. (Click to enlarge) Lieutenant Sedgwick Rice’s letter recommending Sergeant Austin be awarded a Medal of Honor. I cannot praise to [sic] highly the service of Sergeant Austin, who while his troop was engaged in clearing out a ravine in which were lodged a number of hostile Indians, was untiring in his efforts to accomplish this object, he repeadetly [sic] exposed himself to the fire of the Indians and by his example he greatly encouraged the men of his troop. He displayed great bravery in crossing the ravine under a hot fire and maintained his position there until his troop was withdrawn at the time the Hotchkiss gun was put in position. Sergt. Austin is a sharpshooter and from my personal observation I feel justified in saying that he did great execution. 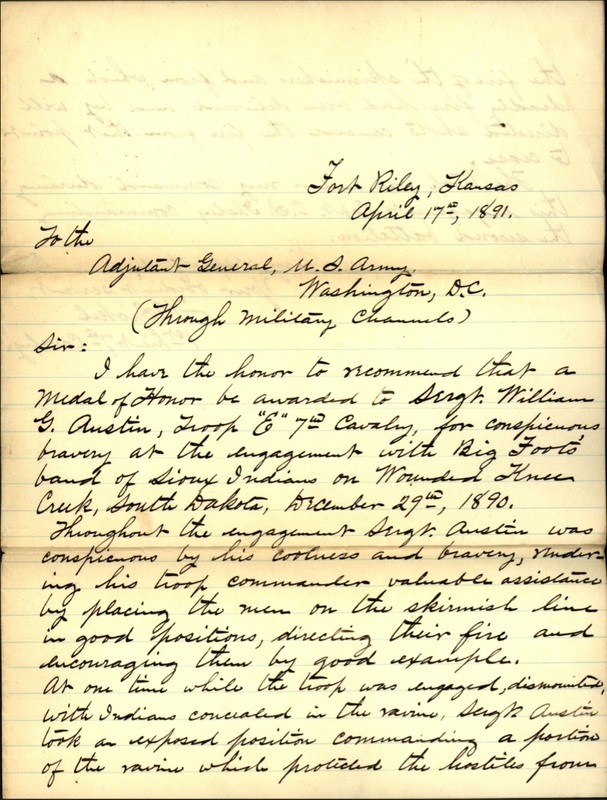 The recommendation lingered at regimental headquarters for several weeks until Captain C. S. Ilsley, who had commanded the second battalion at Wounded Knee, added his endorsement on May 4 and recalled seeing Sergeant Austin during the battle. Colonel Forsyth provided his endorsement on May 5 and Brigadier General Wesley Merritt, Commander of the Department of Missouri, two days later. The War Department approved the Medal of Honor for Sergeant Austin and on June 27 mailed his medal to the regiment at Fort Riley to be presented to him in a fitting ceremony there. William Grafton Austin, born at Galveston, Texas, on January 6, 1868, was the oldest of three children of Charles William and Georgia Bell (Grafton) Austin. 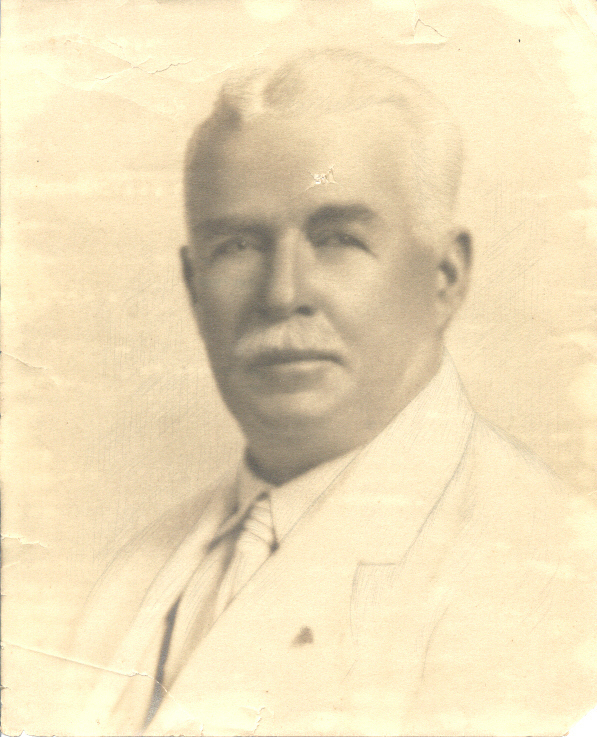 His father, Charles, born in 1833 was a native of Norwich, Connecticut, the son of Andrew Yates Austin and Susan Tenant, nee Rogers. The Austin family settled in Willoughby, Ohio, a few years after Charles was born. As a young man, Charles sought his fortune in Texas working as a captain of a steamer navigating the Gulf Coast between Mobile and New Orleans. At the onset of the Civil War he sided with the South and devoted his service to the Confederate navy. The war tore at the fabric of the Austin family with four sons casting their lot with the Union and two with the Confederacy. Charles Austin gained prominence when he helped design and captain the first iron clad vessel, a tow-boat with ribbons of railroad rails above the water line. The strange watercraft was re-christened from the Enoch Train to the CSS Manassas, in honor of the South’s first victory. The boat had no guns and was fitted with a ram, which Captain Austin used effectively in October 1861 to damage the hull of the Union’s wooden steam sloop of war USS Richmond in the Battle of the Head Passes. Charles Austin continued through the war as a blockade runner, twice being captured and twice escaping. At the end of the war he returned to Galveston and in 1866 married Miss Georgia Bell Grafton, a twenty-one-year-old native of Natchez, Mississippi. She was the eldest of four children of Andrew Grafton and Martha Harlan born in 1844. Her father drowned in the Mississippi River when she was seven, and several years later her mother married widower Benjamin B. Baxter, a resident of Grimes County, Texas, who had six children of his own. Martha died in 1863 when Georgia was eighteen, leaving her the heiress of a large estate. Charles and Georgia Austin lived in Galveston for about ten years where she gave birth to three children: William Grafton, the subject of this post, Alexander Yates, born in 1870, and Susan Tennent, born in 1876. The Austin family moved east shortly after the birth of their daughter, where Charles continued in his nautical profession working in the port of Savannah, Georgia. Young William Austin received his primary and secondary education at the Barnard School, the Massie School, and the Chatham Academy. Seeking adventure, if not fortune, William headed north to New York City, where two weeks after his nineteenth birthday he enlisted in the army. He indicated that he was twenty-four years old, thus avoiding the requirement for parental permission to serve under age. Austin’s recruiter, Lieutenant Wheeler, recorded that Austin was formerly employed as a clerk, stood five feet, nine and a half inches in height, with gray eyes, auburn hair, and a fair complexion. He was assigned to E Troop, 7th U.S. Cavalry, joining the unit at Fort Yates in the Dakota Territory, and later moving with his unit to Fort Sill, Indian Territory. By the summer of 1890 he had risen to the rank of sergeant. He took sixty days of leave in September, joining his troop again at Fort Riley in November a couple of weeks before the unit was ordered to the Pine Ridge Agency. 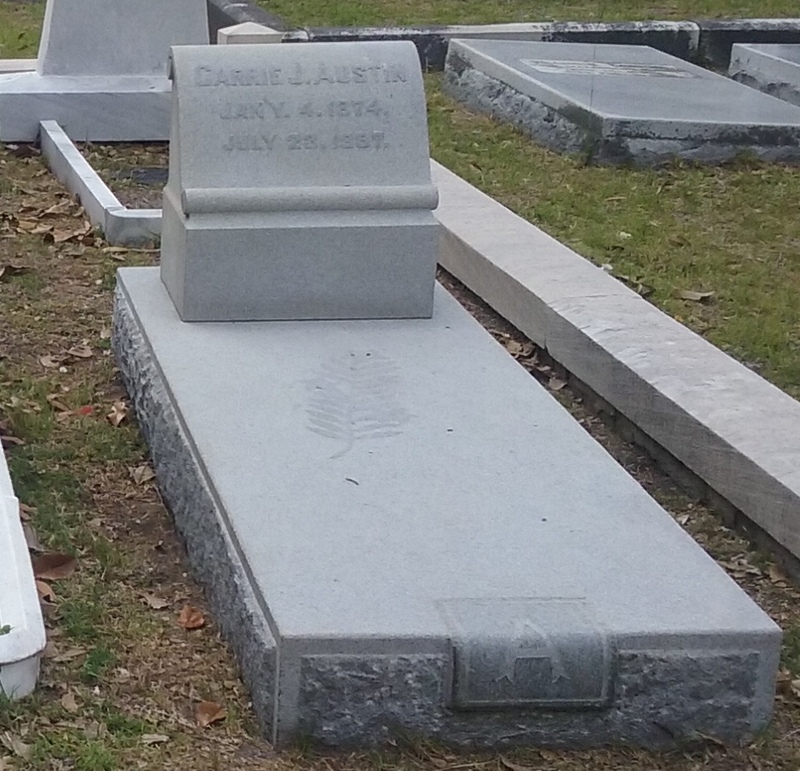 William G. Austin’s first wife, Carrie J. Ratz, and their infant child are buried in the Laurel Grove North Cemetery in Savannah, Georgia. Completing his five-year enlistment as a sergeant with a characterization of service of ‘excellent’, William Austin returned to Savannah where he entered the mercantile business inspecting cotton. His father had passed away in 1889, and William took up residence with his mother, brother and sister. In the mid 1890s he married Caroline J. Ratz, the daughter of Charles Ratz and Elizabeth Kraft. Her father, Charles, left his native Germany at the age of eighteen and emigrated to America arriving in New York City in June 1869. Within two years he had relocated to Savannah and was working as a dyer where he met and married Lizzie Kraft, a native Georgian whose parents were also German emigrants. Caroline, known as Carrie, was their only surviving child, born January 4, 1874, in Savannah; two other daughters, Bessie and Hattie Belle, died in infancy. In the summer of 1897, William and Carrie Austin were expecting the arrival of their first child. Carrie gave birth in the third week of July, but apparently it was a difficult delivery and she died of postpartum hemorrhaging on July 23. Her infant child died the following day. 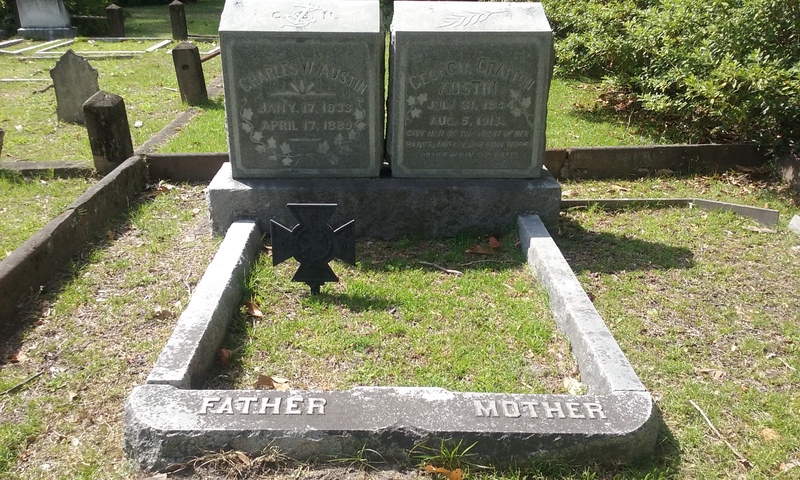 Mother and child were buried in the Laurel Grove North Cemetery, in the same plot as Carrie’s father and not far from where William’s father, Charles W. Austin, was laid to rest eight years earlier. The 2nd Georgia Infantry arrived in Tampa too late for overseas service, but were used to help quell race riots in Ybor City, Florida. While building his mercantile business, William Austin continued to serve his state and his country by enlisting in the Savannah Volunteer Guards in 1894 rising from a private to captain of Company A. Redesignated the 2nd Georgia Infantry, U.S. Volunteers, during the Spanish-American War, Austin mobilized with the unit in command of M Company. The regiment took up station in Tampa, Florida, awaiting transport to Cuba or Puerto Rico, and like so many other regiments, never made it into the war before Spain surrendered its colonies and signed a peace treaty in August 1898. Following the war, Austin continued his service in the Fourth Georgia Heavy Artillery. Captain Austin in 1905 displayed his marksmanship, which Lieutenant Sedgwick had commented on following Wounded Knee, when he competed in a national pistol competition in which he finished seventh out of 118 entrants winning a silver medal and $15 cash. William Austin continued to succeed in Savannah in the first two decades of the new century. He served for six years as the city’s chief of police and served on the board of the Savannah Automobile Club along with Mayor George Tiedeman and other noted leaders of the port city. Austin later became president of the Savannah Motor Car Company representing the newly formed Cadillac Automobile Company, an offshoot of the Henry Ford Company. 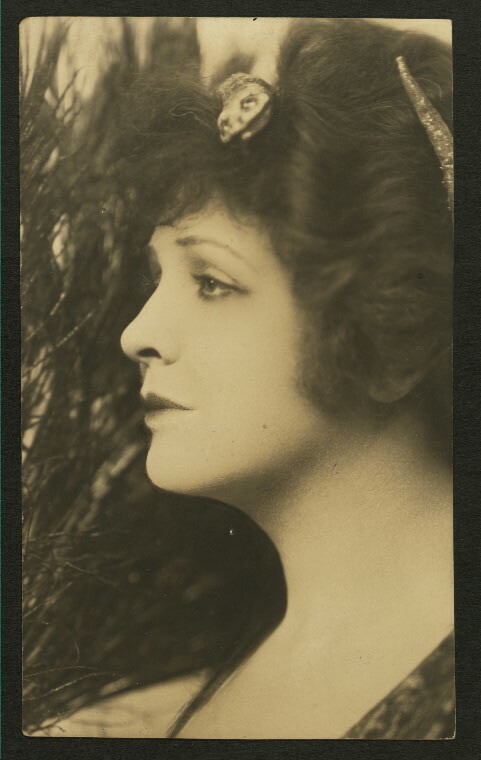 Actress Marie Shotwell was married to William Austin from 1908 to 1916. In the winter of 1907, William Austin met a leading actress whose company was performing in Savannah. Her stage name was Marie Shotwell and she was the widow of William Hawley. Ms. Shotwell was a stage actress who began her career at the age of sixteen. Born sometime between 1871 and 1880, she was the daughter of tobacconist Byron A. and Sarah R. Shotwell, She retired from the stage when she married Hawley about 1899 and lived abroad with her husband and son, Frank W., born in 1900. Following Hawley’s death, she returned to New York and resumed her acting career. Austin and Shotwell were married on September 24, 1908, at her home at Dyker Heights in Brooklyn. Mrs. Austin again stepped away from the stage upon marrying Savannah’s chief of police. The couple lived prominently in Savannah and Marie’s son, Frank, took his step-father’s last name, dropping the Hawley all together. Ultimately the marriage failed with Marie filing for divorce in 1916 on the grounds of desertion testifying that Austin had rarely spoken to her in the past four years even while living in the same house. Despite the breakup of his mother and step-father, Frank kept the last name of Austin for rest of his life. Colonel W. G. Austin, Quartermaster Reserve Corps of the National Army. As the nation moved to a war footing again in 1917, William Austin donned the uniform of a major in the newly formed National Army. He served as a Quartermaster in the Reserve Crops where he plied his skill in managing stevedores in France as the first elements of the American Expeditionary Forces arrived in Europe. He met with such success that he was promoted to colonel and sent back to the United States to recruit several regiments of stevedores. He then took command of the 302nd Stevedore Regiment composed of 127 officers and almost 7,000 enlisted men. Colonel Austin returned to the United States again in March 1918 at General John J. Pershing’s direction to recruit additional stevedore regiments. 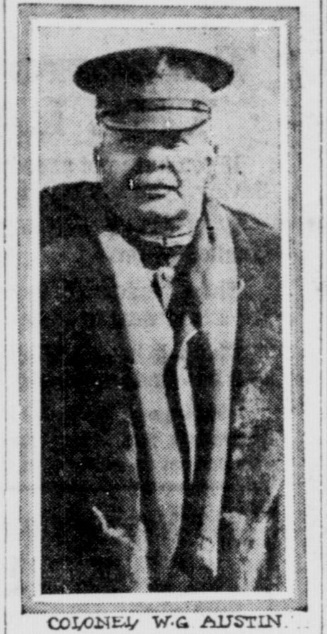 The forty-nine year-old colonel was able to carve out time in 1917 to rendezvous with Mrs. Frances Alice Brooks of Allenhurst, New Jersey. The two met up in Washington, D.C., on August 25 and were quickly married that day after purchasing a marriage license. Born in Warwick, England in 1894, she was the daughter of Charles Brooks and Fannie Peyton. At the time that Frances married William, she had a three year old daughter, likely from a previous marriage. The toddler, Hope Brooks, was given her new father’s family name, and mother and daughter resided in Savannah while the colonel was in Europe and traveling the U.S. on his recruitment duties. Following the war, William Austin moved his family to the West Coast and settled in Palo Alto, California, where he enjoyed the final chapter of his life in retirement. He and Frances had a daughter, Margaret Grafton, in 1919, and spent the next decade on numerous cruises in the Pacific. Austin passed away on July 15, 1929, at the age of sixty-one. His body was cremated and the ashes given to the family. Austin’s ex-wife, Marie Shotwell, returned to the acting profession following their divorce and appeared in a number of silent movies alongside W. C. Fields. She died in 1935 from a stroke while working at the Astoria film studio, her son, Frank, her only living relative. According to the newspapers, she was fifty-four, but may have been as old as sixty-three. Marie Shotwell was buried along side her mother in Westerly, Rhode Island. Austin’s wife, Frances, survived her husband by almost forty years, never remarrying. She spent her final years at their daughter’s home in Morganton, North Carolina, where she died in 1968. Her surviving daughter, Mrs. Margaret Grafton (Austin) Fergusson, honored her mother’s wishes and had her cremated. The final disposition of Colonel William Grafton Austin’s ashes are unknown. As he has no grave marker, he is considered one of some 400 Medal of Honor recipients who are lost to history, one of three who were awarded for actions at Wounded Knee, the other two being Marvin Hillock and Matthew Hamilton. A fitting place for a memorial marker would be in the Laurel Grove North Cemetery in Savannah, Georgia, where Austin’s parents and his first wife and infant child are buried. Save that of the first and last decade of his life, William G. Austin called Savannah his home for more than forty years and served his city, state, and nation well. William G. Austin’s parents, Charles W. and Georgia Grafton Austin, are buried in the Laurel Grove North Cemetery in Savannah, Georgia. Adjutant General’s Office, Medal of Honor file for William G. Austin, Principal Record Division, file 3466, Record Group: 94, Stack area: 8W3, Row: 7, Compartment 30, Shelf: 2. Research conducted by Vonnie S. Zullo of The Horse Soldier Research Service. William Hardent, A History of Savannah and South Georgia (Chicago and New York: The Lewis Publishing Company, 1913), pp 697-699; Edward Francis Fremaux Beixedon, Jr., The Ancestors and Descendants of Dr. David Rogers (Privately published, 1921), 34-40. Galveston Daily News (Galveston, TX: Wednesday, 6 Aug 1913), 5; Ancestry.com and The Church of Jesus Christ of Latter-day Saints, United States Federal Census[database on-line], Provo, UT, USA: Ancestry.com Operations Inc, 2010, Year: 1880, Census Place: Savannah, Chatham, Georgia, Roll: 138, Family History Film: 1254138, Page:287C, Enumeration District: 015; Image: 0137; Year: 1860, Census Place: Grimes, Texas, Roll: M653_1295, Page: 263, Image: 532, Family History Library Film: 805295. Hardent, A History of Savannah, 699; Ancestry.com. U.S. Army, Register of Enlistments, 1798-1914 [database on-line], Provo, UT, USA: Ancestry.com Operations Inc, 2007. Samuel L. Russell, photo., “Carrie J. Austin,” Laurel Grove North Cemetery (Savannah, 21 Jun 2015). Laurel Grove North Cemetery records show that infant Austin, died 24 Jul 1897 and was buried in plot 1928, the same plot as his mother, Carrie J. Austin, and her father, Charles Ratz. However, there is no grave marker for infant Austin, thus he likely was buried with his mother, who died in childbirth along with her infant. Ancestry.com, U.S. City Directories, 1821-1989 [database on-line], Publication Title: Savannah, Georgia, City Directory, 1896, Image: 55; Beixedon, Ancestors and Descendants of Dr. David Rogers, 59; Savannah Georgia Cemetery and Burial Records, Savannah, Georgia: Research Library & Municipal Archives City of Savannah, Georgia; Ancestry.com. Savannah, Georgia Vital Records, 1803-1966 [database on-line], Death: 1897, Image: 56; City of Savannah, Georgia Records – Health Department, Vital Statistics Registers, Savannah, Georgia: City of Savannah. 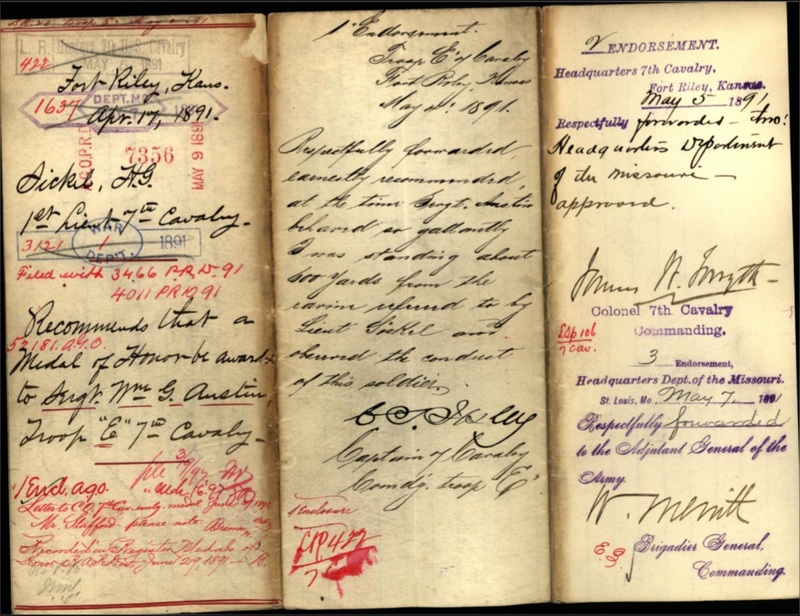 Beixedon records that William Austin married Caroline Ratz in 1887, but this date is problematic, as William clearly was in New York in January of that year when he enlisted in the army and headed west. Caroline just turned thirteen at the beginning of 1887 making a marriage that year even more suspect. While I have not been able to find record of their actual marriage date, I place it in the mid 1890s after William Austin’s enlistment when he returned to Savannah. Todd Womack, “Spanish-American War in Georgia,” New Georgia Encyclopedia (http://www.georgiaencyclopedia.org/articles/history-archaeology/spanish-american-war-georgia) posted 12 Aug 2005, accessed 1 Feb 2015; Georgia Archives, “2nd Georgia Infantry, U.S. Volunteers,” Flag Collection, Capitol Museum Collection (http://cdm.georgiaarchives.org:2011/cdm/singleitem/collection/flag/id/85/rec/30), accessed 1 Feb 2015. Hardent, A History of Savannah, 699; A. E. Sholes, compiler, Chronological History of Savannah, From Its Settlement by Oglethorpe down to December 31, 1899, Together with a Complete Record of the City and County, and Savannah’s Roll of Honor, A Roster of the Soldiers who have in three wars Gone Forth at their Country’s Call, from this City (Morning News Print, 1900), 182; Secretary of War, Annual Report of the War Department for the Fiscal Year Ended June 30, 1905 vol. 1 (Washington: Government Printing Office, 1905), 165; Clark Hopewell, ed., “Second Georgia Passed in Review,” The Constitution (Atlanta: 29 Sep 1898), 5. Hardent, A History of Savannah, 699; H. M. Swetland, pres., “Vanderbilt Cup Rules Set New Weight Limits,” The Automobile Weekly vol. 18, no. 15 (New York: The Class Journal Company, 9 Apr 1908), 512. Billy Rose Theatre Division, The New York Public Library, “Marie Shotwell” New York Public Library Digital Collections,(http://digitalcollections.nypl.org/items/510d47df-4191-a3d9-e040-e00a18064a99) accessed 1 Feb 2015. Clark Hopewell, ed., “Savannah Chief to Wed,” The Constitution (Atlanta: 20 Sep 1908), 2; United States Federal Census, Y ear: 1910, Census Place: Savannah Ward 4, Chatham, Georgia, Roll: T624_178, Page: 5B, Enumeration District: 0075, FHL microfilm: 1374191; J. W. Spear, ed., “Actress Seeks Freedom from Husband Who Was Once Savannah Police Chief,” Arizona Republican (Phoenix, Az. : Arizona Publishing Company, 9 May 1916), 2; Q. David Bowers, “SHOTWELL, Marie, Actress (1915-1917),” Thanhouser Films: An Encyclopedia and History (http://www.thanhouser.org/tcocd/Biography_Files/ind4_qhka.htm) accessed 1 Feb 2015. Henry G. Sharpe, The Quartermaster Corps in the Year 1917 in the World War (New York: the Century Co., 1921), 65; John J. Pershing, Cablegrams Exchanged Between General Headquarters, American Expeditionary Forces, and the War Department, 1917-19, Cable Number: 673, Cable Place: General Headquarters, A.E.F., Cable Date: 03-MAR-1918, NARA M930, Regular, confidential, and courier cablegrams exchanged between General Headquarters, AEF HQ, and the War Department. John H. Zuver, ed., “Swinging Hammer for His Uncle Sam,” The South Bend News Times (South Bend, Ind. : New Times Printing Company, 29 Mar 1918), 14. C. T. Brainard, “War Call First Aid in Romantic Wedding,” The Washington Herald, (Washington: Washington Herald Company, 26 Aug 1917), 12. United States Federal Census, Year: 1920; Census Place: Purissima, Santa Clara, California; Roll: T625_146; Page: 2B; Enumeration District: 125; Image: 687; Ancestry.com, California, Death Index, 1905-1939, Years: 1905-1929, Surnames: A-E, Image: 101; Ancestry.com, New York, New York, Death Index, 1862-1948, Certificate Number: 5934; “Marie Shotwell, 54, Dies from Stroke at Screen Studio,” Brooklyn Daily Eagle (New York: 19 Sep 1934), 13; Ancestry.com, North Carolina, Death Certificates, 1909-1975, Certificate Number: 26068. Samuel L. Russell, photo., “Austin Family Plot,” Laurel Grove North Cemetery (Savannah: 21 Jun 2015). 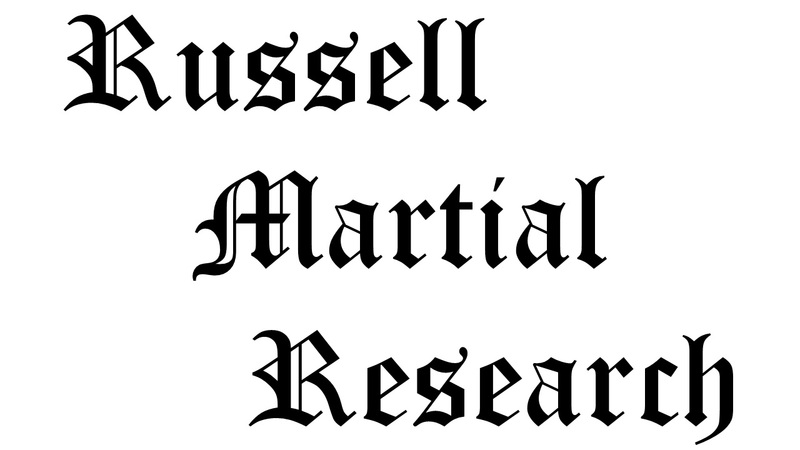 Citation for this article: Samuel L. Russell, “Sergeant William Grafton Austin, E Troop, 7th Cavalry – Conspicuous Gallantry,” Army at Wounded Knee, (Sumter, SC: Russell Martial Research, 2013-2015, http://wp.me/p3NoJy-GP) updated 21 Jun 2015, accessed date __________. This entry was posted in Award Recipients, Enlisted and tagged 1890, 7th Cavalry, 7th Cavalry Regiment (United States), Battle of Wounded Knee, Cavalry, Fort Riley, Medal of Honor, Wounded Knee, Wounded Knee Creek, Wounded Knee Massacre. Bookmark the permalink. Updated on 21 Jun 2015 to correct information concerning the death of William Austin’s first wife and infant child.